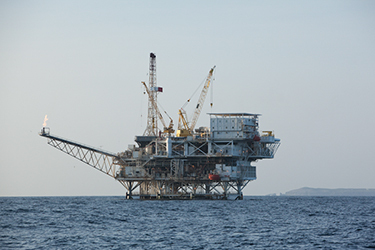 In 2011, EDC research uncovered the fact that Venoco had fracked from an oil platform off our coast, spurring us to dig deeper to determine if more fracking operations had happened or were planned in the Santa Barbara Channel. EDC released the report: Dirty Water: Fracking Offshore California, in late 2013. This report provided the first comprehensive look at how oil companies have escaped notice for years while conducting hydraulic fracturing (aka fracking) and acid well stimulation (acidizing) operations from oil platforms off our shores. Fracking is the controversial and risky technique in which sand, water, and an unknown cocktail of chemicals are forced down a well bore at high pressure to stimulate the flow of oil or gas – a technique that presents enormous risks to our marine environment. Acidizing similarly injects chemicals, primarily hydrochloric and hydrofluoric acids, down the well bore to dissolve rock and access oil and gas. In 2014, we filed a lawsuit challenging the government’s failure to provide for public and environmental review prior to issuing permits authorizing fracking and acidizing. EDC successfully settled that lawsuit in early 2016 securing the first ever environmental review of these risky offshore practices as well as a new level of public transparency. Unfortunately, the federal agencies’ quick environmental analysis was deeply flawed and alarmingly concluded that these practices have no significant impacts. In November 2016, this time joined by Santa Barbara Channelkeeper, EDC once again filed a first-in-the-nation lawsuit against federal agencies for failure to consider risks to threatened and endangered species and inadequate environmental review and consultation prior to approving these potentially harmful projects. In November 2018, EDC secured another victory on this important issue when a federal judge issued a ruling declaring that the federal government violated environmental protection laws when approving permits for these dangerous well stimulation techniques. This ruling temporarily halts all fracking and acidizing from West Coast offshore platforms until wildlife agencies can be consulted and the California Coastal Commission is given an opportunity to review these practices.